More luxury buildings are boosting their amenities for their smallest residents—family pets. In an effort to court pet-loving house hunters, new high-end developments in several big cities now offer lavish hangouts for the four-legged, from rooftop dog parks to doggy club rooms and swimming pools. “We felt that it needed to be someplace that you feel comfortable bringing your pet,” says Richard Lake, a founding partner of Roadside Development, of his company’s City Market at O in Washington, D.C., which offers a rooftop dog run. In some cases, services offered for pets go far beyond dog-walking and grooming, to include spa sessions and even pet fitness classes. “It’s been a big draw,” says Emily Moreland, of Moreland Properties, which is marketing the Austonian, a 56-story condo building in Austin, Texas. Ms. Moreland lives in the development with her 11-year-old border collie, Sugar. Ritz Carlton Residences, Miami Beach, Fla. This luxury residential development going up in Miami Beach plans to offer a leash-free dog park, as well as a pet spa that will provide health services such as grooming and dental care. Adjacent to the Intracoastal Waterway, the 7.2-acre property, expected to open in 2016, will also feature shaded pathways for dog walking. “I went all out to accommodate pets,” says Ophir Sternberg, founding partner and CEO of Lionheart Capital, the building’s developer. When the building opens, Mr. Sternberg plans to move in with Ginger, his 7-year-old Maltese. This Midtown luxury rental development, which opened in 2011, is home to Dog City, a 1,000-square-foot, members-only club catering to the building’s canine residents. Owners can relax with their pets on a terrace, where a dog-bone-shaped pool is available for use in the summer. In an indoor day-care facility, run by trained “dog whisperers,” owners can schedule play dates with other pups who are members of the club, as well as yoga classes and treadmill sessions. Dog City membership costs $250 a year and includes a monthly ear wash and “pawdicure,” as well as daily report cards on pet behavior. Services such as monthly walking packages and overnight dog sitting can be purchased by all residents. “Anything your mind can create, they can help you with,” says Daria Salusbury, senior vice president of Related Companies, the building’s developer. Residents of this high-rise luxury-condominium building in Austin have access to a 600-square-foot, outdoor dog park on the 10th floor, which has a couch and table for the owners. The Austonian also offers a self-service grooming room that gives residents the use of bathtubs and a grooming table, as well as free shampoo, conditioner and towels. “It would have been very awkward” not to accommodate the building’s pet owners, who make up nearly half the Austonian’s residents, says Ms. Moreland. 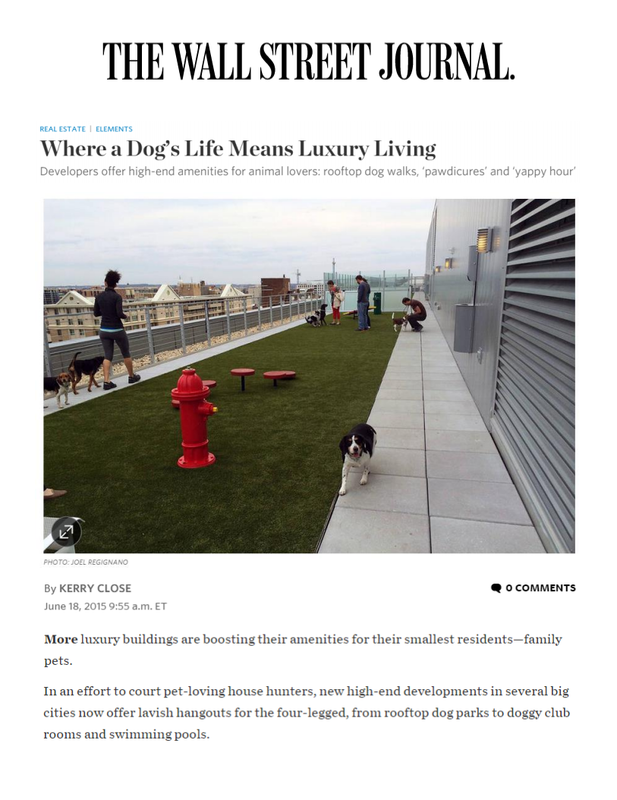 City Market at O, Washington, D.C.
Canine residents of the nine-story rental high-rise can enjoy a rooftop synthetic-turf dog run with decorative fire hydrants, a water fountain and dog-friendly couches, Mr. Lake says. City Market also features a pet grooming area with two tubs and a drying station. Mr. Lake says dogs and owners in the building have developed a camaraderie with one another, in large part due to regular “yappy hour” social mixers that are held in the building. Fido’s life of luxury, however, comes at a cost. Residents must pay upfront to bring their pets into their units: a $500 nonrefundable fee for one pet and $800 for two, plus they have to shell out a monthly fee of $60 a pet.